Major League Baseball star Andrew McCutchen made a huge announcement on ”The Ellen DeGeneres Show” earlier today. 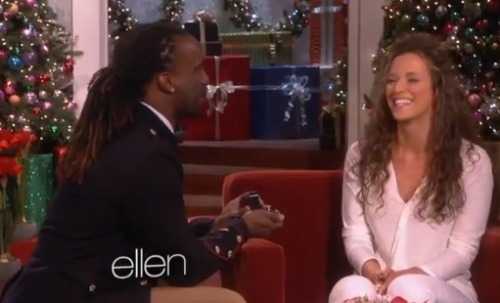 The 2013 National League MVP McCutchen surprised his girlfriend of 4 years Maria Hanslovan with a marriage proposal in front of Ellen’s live audience. McCutchen first showed a heartfelt video to his girlfriend (who was sitting in the audience) expressing his love for her, then told her to come up the stage. McCutchen then got on one knee and asked Maria to marry him.